This topic has become a major issue for many parents today, as the majority of us are working parents with harsh schedules. Thus, having a baby who keeps waking up throughout the night, is fussy at nap-time and generally does not sleep as soundly as they probably should be, can be something very difficult and stressful for parents Inshaa Allah, and particularly for working parents who may not function well without a good night’s rest. Now before I even get into this I would like to share another one of my little ‘mummy-secrets’. Do you know the saying, “Expect the unexpected and you won’t get disappointed”?? Well this is something I live by and will continue to live by Inshaa Allah and this belief has filtered into so many parts of my life…It all comes down to faith in Allah(swt) and being patient. It’s having that ability to take, gracefully and with gratitude, whatever the world throws at you. As a result, with this important ‘never give up!’ perspective on things, you can now approach motherhood not from ‘what you want it to be’ but rather ‘what Allah(swt) wills it to be”. Prepare as best as you can by doing your reading and doing your shopping, and then accept parenthood for what it is and not for what you would like it to be. Having the patience to be content with what you have, while working as hard as you can to maintain it, may open many new doors and is the true definition of ‘Gratitude’ and accepting the tests of your Lord. With most babies, the reason why they may not be sleeping well, may be purely environmental. It just a matter of cracking their code and narrowing down the possible reasons for this restlessness. These ‘environmentally sensitive’ babies are the ones I will be addressing in this article. Remember, if none of these methods work and you are worried that something may really be wrong with your baby, DO NOT hesitate to see your pediatrition about it. Be very careful with your children and pay very close attention to their needs and changes in their behaviour. 1) It’s not the baby’s fault! DO NOT take your frustration out on the baby. 2) It’s not your spouse’s fault! DO NOT take your frustration out on your spouse. 1) Breastfeeding – I cannot emphasize enough, the importance, convenience and even the cost-effectiveness of breast-feeding your newborn exclusively for the first 6 months of their lives. As Muslims, the recommended time frame for breastfeeding is 2 years. I have breastfed each of my children for 2 years (the third one is still young and completing his turn) and I must urge all mothers, from my own personal amazement, to breastfeed your babies. This is one of the most precious gifts you can give to your child. I strongly influences their sleeping habits and it is so much easier on both you and them to simply lie down with them, cuddle-up and nurse(breastfeed) them back to sleep instead of having to wake up in the middle of the night to mix a bottle. 2) Swaddling – For newborns, you must remember that this tiny fragile little creature has just come out of a very protected, warm and snugly place. Your womb was their ultimate comfort zone (no pun intended :p)!!! Thus although not all babies are born with this need to be snuggled, many babies do indeed feel that need to wrapped, bundled and cradled. Thus, one of the best ways to give your newborn that constant warm and protected feeling would be ‘swaddling’ them. 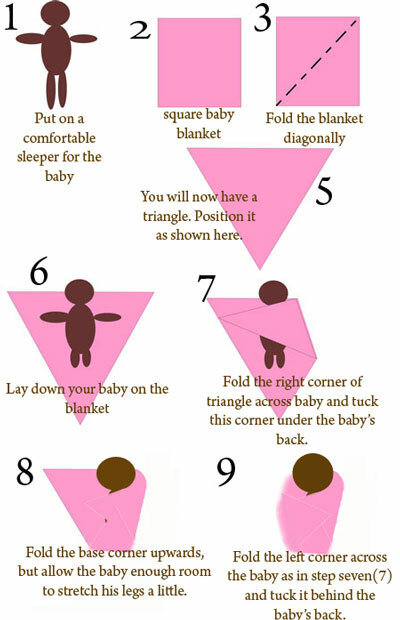 This is where you wrap them with a baby blanket in a particular way, so that their limbs are kept close to their bodies and the blanket is fitted (not too tight) to their body shape. In the end, you baby should look like a content little cucumber. 4) Keep your surroundings clean. Children respond to cluttered and claustrophobic conditions. Make sure the area they play and sleep is well organized, clean and pleasing to the eyes. You don’t have to live in fancy mansion or have a full-time maid to simply keep you home organized. Just keep the clothes off the floor, have a toy chest for all the toys to just throw them into and “don’t leave for tomorrow what you can do today!” You can clean the dust and specs on the carpet, walls, bathrooms and floors on the weekends when you have your husband to help you. But the big and visible clutter should be organized in a way that is easily re-packable and everything should have its designated place. 6) Sleep chest to chest – Some newborns simply don’t like to be alone. They need constant human contact and satisfying this need is perfectly okay! There is no rule that states that you should not hold your baby too much, or else he’ll develop attachment issues. Such a thing has never been proven. 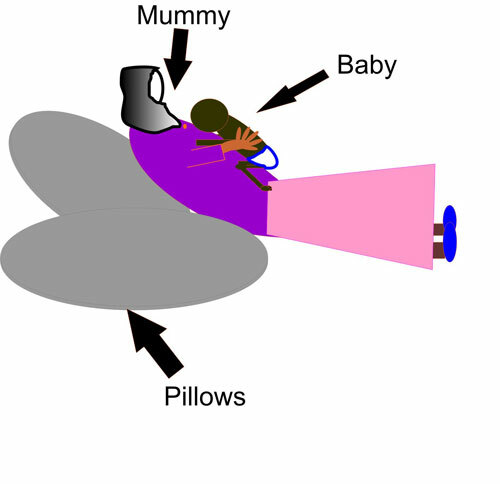 If your baby is the ‘needy’ type, you can simply prop yourself with a pillow and lie at a slight angle. Then put the baby to cuddle up to you, chest to chest, with his knees up to his chest(like a little froggy) or just lying flat on top of you. 7) Rocking to sleep – This goes all the way back to your great grandma! It’s the oldest trick in the book. If you get the baby accustomed to it, this little tip can come in very handy when you have more than one child to look after. This can be done in a rocking chair or a hammock. Be sure to figure out which way you baby likes to be held. Does he like the tradition cradle position or does he like the ‘modern-baby’ up position where he rests his head on your shoulder. 8) Walking the baby – This is usually daddy’s job! Just hold you baby in which ever way he/she likes to be held and walk around with them. You can try little walks outside, in the garden, around the house, etc until he nods off and enters dreamland. 9)Train your kids to fall asleep in both noisy and quiet settings – For example, rock the baby in an open room or outside in the porch. The wisdom behind this is that when you put the baby to sleep in noise he/she will learn to sleep through noisy situations. Thus when they are sleeping in quiet settings, they won’t have you walking on egg-shells hoping that you won’t squeak the door too loudly and crumple a piece of paper too harshly. 10) Hold your baby and sway next to an open window with an appealing view- This will stimulate their sight and capture their attention, quiet them down while they are observing the world outside and listening to its sounds and the small breezes will calm them down long enough to just drift into sleepiness as your sway. 11) Qur’anic Recitation – Babies respond to recitation. They always have this ‘what are you saying?’ look on their first when you first start reciting. Please, I urge parents to recite for your children. Introduce them to the Qur’an early on in their lives and let this become a natural part of their growth. Recitation has a calming effect on babies…a soothing and comforting effect. This was 100% true for my kids. So try it out on yours Inshaa Allah! 13) Different sleep positions – Babies, just like adults, have preferred sleeping positions. Some like to sleep on their side, some on their backs and some on their bellies. But the most appropriate position for a baby to sleep, that meets medical, health and safety standards, is to get your baby accustomed to sleeping on their backs. I they absolutely cannot handle sleeping on their back, try putting them on their right side as this is also the sunnah of our beloved Prophet (sal allahu alaihi wa salaam). 14) Steady sounds – Some children actually cannot fall asleep unless there is a steady sound playing in the background. It can be the sound of the air conditioning, a vacuum cleaner, running water, birds chirping, etc. But most babies also enjoy the sound of a heartbeat. Thus if you don’t have a device or recording that makes this sound for you, you can simply place your baby’s ears to your chest and your heartbeat will sing him to sleep Inshaa Allah. 15)Full Tummy – Always make sure your baby has a full tummy at bedtime! This goes for children generally. Always make sure they have been fed a proper dinner to suit their ages before bedtime arrives Inshaa Allah. Allow them some time to digest and then put them to sleep Inshaa Allah.